Raphael Dembélé (1989 born in Bamako, Mali) is a singer, arranger and sound engineer. First contact with music at the age of ten as a singer in Bamako’s cathedral. At the age of 15 he was placed first on national level in the music competition NAR (Nescafé Africain revelation) and represented his country together with other artists in the international competition in Ghana. Raphael decided to combine studies and music and therefore to get professionalised in music. 2013 he established his first recording studio to give the technical opportunities to young people to record their music, to support urban music and to create a pool of talented musicians. Being conscious of the need of opening ourselves up to the world, I agree to take part in the Operndorf Afrika program for to develop my potentials. Operndorf Afrika’s program is a chance to me to give and to take, to work with artists with different views and styles. My involvement in the different workshops will, without doubt, activate a great sense of creativity. Zonatan Dembele (1988 born in Koutiala, Mali) is a bassist, guitarist, singer and arranger. Zonatan started his musical education at the age of nine, in particular by accompanying church choirs. He studied English at the university of literature of Bamako which he left with a B.A. degree in 2010 before he decided to follow his first passion and to resume his studies in music at the conservatory of Bamako in the same year. During his studies, the Danish government offered him a scholarship that allowed him to participate at an exchange programme at the Royale Academy of Aarhus in Denmark for 3 months, followed by another exchange programme at Sibelius Academy in Helsinki in Finland for four months in 2014, financed by the Finish Government. My striving for creation and personal inspiration I have always dreamed of becomes reality thanks to the Operndorf Afrika’s artistic programme. 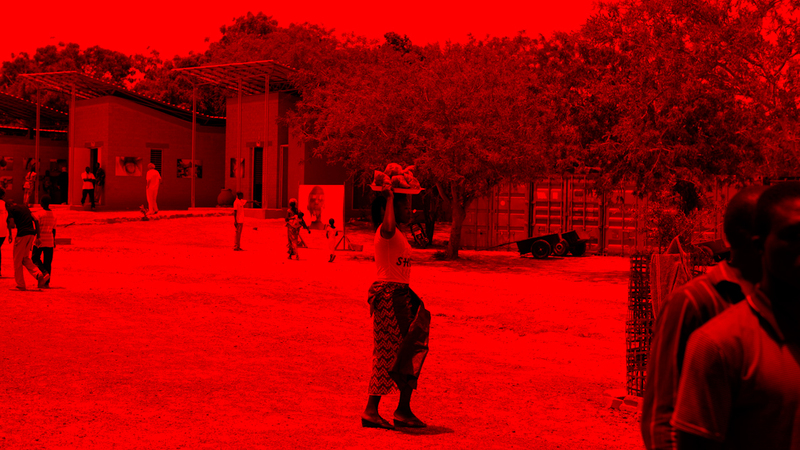 Operndorf Afrika allows a space for exchanging, sharing experience and knowledge with other artists with different horizons – in the field of music as well as in other artistic and cultural fields. As a musician, this residence will be an opening that allows me not only to gain knowledge and professional experience from established and international artists but is also a way of performing on national and international stages. Beyond this, it will be a chance of examination, research and creativity via the workshops we will do. The artist Thomas Zipp teaches painting and multimedia at Universität der Künste Berlin since 2008. His current students Lisa Braun, Ferdinand Dölberg, Milan Dölberg, Fabian Hub, Magnus Krüger, Yannick Riemer and Greta Wildhage take part in this year’s residence. Right after we will arrive in October 2018, there will be the opening of Claus Föttinger’s “Bar 3000“– how fitting, because we think (and apparently Claus Föttinger too) that artistic and cultural interaction has to take place right directly on site and without predetermined objective. We want to begin a journey free of expectations, concrete concepts and plans. Interacting with the people and the place will form the project and lead it in an unpredictable direction. This unpredictability corresponds, in our opinion, to Christoph Schlingensief’s idea of Operndorf Afrika and its artistic practice. In this sense, we are looking forward to the collaboration with Zonatan Dembele and Raphael Dembele! Lisa Braun (1988 born in Berlin) studies visual arts at Universität der Künste Berlin with Professor Thomas Zipp since 2014. In her material-based practice, she deals with metaphorical and biomorphic forms. Her focus is on dealing with the physicality of forms and their effects on the spectator. Therefore, she uses materials such as latex and clay to create dynamic impressions of mass and surface. Due this, a flexible object can appear hard and inflexible. Gestures become kind of snapshots that seem to freeze the material’s transformation process from an arbitrary point in time on. Ferdinand Dölberg born in 1998 in Eisenach, DE. Since 2017 he studies at the UDK Berlin, Fine Arts with Prof. Thomas Zipp. The main topics of Ferdinand Dölberg’s work are questions about one’s own localization within social structures, interpersonal relationships, and the questioning of individuality. Fictional characters, mask-like faces and absurd body shapes, with changing gender identities, are the main subject of his paintings and drawings. The display of his works are self-made spaces in and behind which the artist hides or encloses himself. In this way, the works communicate not only visually, but also verbally through direct interaction between the artist and the viewer. However, these rooms not only serve as exhibition space, but also as a continuous workplace and refuge for the artist. Milan Dölberg, born 1990 in Aachen,DE. He studied from 2011 – 2014 print and mediatechnic at the Beuth University of Applied Sciences. Since 2014 he is studying fine arts ( Prof. Thomas Zipp, Tillman Wendland) at the University of Arts, UDK as well as political sciences at the Free University, FU in Berlin. In Milan’s work societal norms and social identities are being relocated and repositioned. Self built spaces stand for themselves as art works but also serve as a display for paintings, performances, drawings and New Media. Found material is being implemented in a new surrounding and hence given a new context. Fabian Hub (1988 born in Mainz) began his studies in visual arts at Akademie für bildende Künste Mainz with Professor Friedemann Hahn. Since 2015, he studies at Universität der Künste Berlin with Professor Thomas Zipp. In 2017, he took part in an artist-in-residence program in Finland (Nelimarkka Museo, Alajärvi). Fabian Hub works mainly with oil on canvas. Everyday activities, personal and trivial issues, and their location within the art of painting set the content framework of his work. In an interplay between the direct implementation of thoughts, subjects, links, compositional decisions and complexity reductions, a dialogue is created, that becomes visible in many layers and structures. Even without a concrete representation of space, a sense of light and depth is evoked. Within this “room” there are traces of the whole process, such as text fragment compositions, that can be gesture, placeholder, comment, quote or purely formal element. Magnus Krüger (1990 born in Berlin). After completing his three years’ studies in art history with a focus on Europe and America and additional courses in African history and cultural studies at Freie Universität Berlin, he studies visual arts at Universität der Künste Berlin with Professor Thomas Zipp since 2016. Magnus Krüger’s work consists in collages, screen printing, video art and installations. Frequent topics are the reflection of social causality and personal subjects. He often recomposes separate fragments in a new textual context which manifests in spontaneous but also conceptual working methods. Yannick Riemer (1990 born in Niedersachsen). Following his training as a graphic designer in Hamburg (2010-2013), he studies visual arts at Universität der Künste Berlin with Professor Thomas Zipp. During his studies, he took part in artist-in-residence programs in Scotland (Crinan, Argyll) and Finland (Nelimarkka Museo, Alajäryi). In his drawings, screen printings and paintings, Yannick Riemer deals with issues like readability, signs and symbols, such as the development of a cryptic language. The focus of language development is on signs and symbols. Icons, cave paintings, runes, logos, “magical” signs, technical drawings, houses, jewellery, flags, uniforms, structures, etc. – everything that passes a first intuitive evaluation is recorded. A great number of sketches form kind of an encyclopaedia, where the different signs merge over and over again, are distorted and newly developed, based on their sign language, and then serve as a basis for artistic work. Its own “logic” becomes increasingly independent and is, after finishing the work, hardly analysable, even for the author. Greta Wildhage (1991 born in Hannover). Following her two years-studies in architecture in Potsdam, she studies visual arts for the teaching profession at Universität der Künste Berlin with Professor Thomas Zipp since 2016. Her artistic focus is on drawing and painting. Her work is not based on a restricted number of themes or autobiographic questions but develops an emotional world of pictures that opens up to the observer directly by a spontaneous and expressive working method. Atmospheres are captured away from concrete, real incidents, persons and places and leave the interpretation open, such as the formal composition itself. The Artist-in-Residence of the year 2018 was realised with the kind support of the Federal Foreign Office.